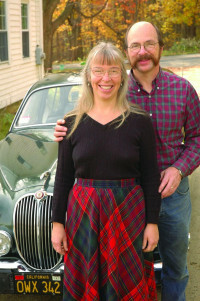 Rogers Motors, also known as Jolly Rogers Motors and Albion Wheels, is a family business, run by Geoff and Andrea Rogers of Shutesbury, Massachusetts, USA. It was founded in the late 1970s when Geoff discovered that he had many more British car parts than he would ever use, and began selling some. Initially, the business also included repairs and service on MGs, Austin-Healeys, Jaguars and Triumphs, as well as Volvo 122S Amazons and P1800s, which were common transportation on Cape Cod, Massachusetts, in those days. The business has become a family operation, specializing in new, used and New Old Stock parts and accessories for British cars and bicycles. We make annual trips to England to buy inventory, and occasionally sell cars as well. We own and drive MGs, Jaguars, and old Volvos, and have decades of practical hands-on experience with the things we supply. We love what we do, and it is our hope that the products we sell will add a little sparkle and English sunshine to our customers and colleagues in the English car and bicycle hobby. Most car enthusiasts know that there is a wide range of quality in parts available for older cars. This is true for cars of any nation, and British ones are no exception. In most cases, New Old Stock (NOS) parts are the highest quality. These are parts made by the original manufacturer, usually a long time ago, but never fitted or used. They are, by definition, as good as the cars ever were, but they can be very expensive, especially in the original packaging. We sell NOS parts when we can get them. Reproduction parts are widely available today, but they vary widely in quality. We have all heard of, or experienced, new rubber parts that crack and fall apart within a year, chrome that flakes off or rusts early in life, and all manner of items that simply don’t fit or function the way the original parts did. We strive to sell the highest quality parts that are made today, and we offer a 100 percent satisfaction guarantee on everything we sell, but the sad fact remains that it is simply impossible to find high quality reproductions of certain parts. We also sell used parts, but these obviously vary in terms of condition and are priced accordingly. We will provide you with honest descriptions and pictures of any product we sell, and rest assured, if it’s a British part you are seeking, we can almost certainly find you one!